Kids love to get filthy. Honest. It's something of an art form for them. My own little girl can get dirty if she so much as glances at a bit of soil. It shouldn't come as too much of a surprise when I say that most kids love to indulge in a spot of gardening. Not only does it allow them to get nice and grubby, it can also encourage fussy eaters to be a little less afraid of what's on their plate. After all, what better new food to try than one you have grown yourself? Take a look at these top tips for tiny gardeners. You'll need seeds. Talk about stating the obvious. Packets of various seeds can be picked up fairly cheaply from gardening centres, although if money is tight there are various ways to obtain free seeds. Try the organised seed swaps on Facebook - or simply swap with your friends and family. Remember to involve your little ones in the hunt. You'll also need to get some tiny gardening tools. Grown up versions are not only too heavy for kids - they're also potentially dangerous. Treat your kids to some children's gardening tools designed just for them. Set aside an area of your garden for use solely by your children. That is unless you fancy the idea of your prize baby lettuces getting trampled. It's more fun for kids - and less stressful for you - if you have a dedicated area for their gardening efforts. Children prefer instant gratification. While no seed will provide a crop in minutes, there are a few that are faster growing than others. Continual gratification is perhaps the next best thing to instant gratification, so it's a good idea to create a planting schedule to ensure your children see regular results. Although not quite instantaneous, cress should be the first thing that you attempt to grow. There's nothing else that will be ready to eat in a matter of days. Plus, you can grow cress all year round. 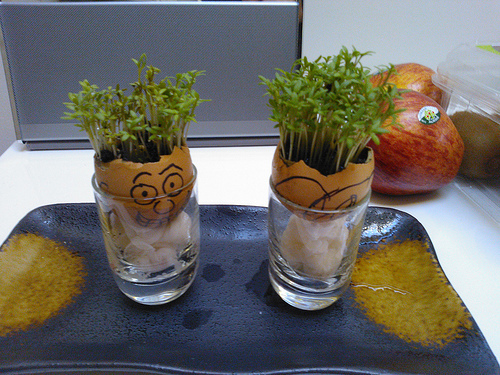 Crank up the excitement levels by allowing your kids to grow cress in egg shells that they've decorated themselves. There's something rather special about being able to eat something right off the plant. That's why tomatoes are great for growing with children - particularly the sweet cherry variety. Although it takes a while for the fruit to grow, you can keep your child interested by helping them to keep tabs on the height of the vine. Another plant that will yield fairly fast results is the humble green bean. Kids will love how quick they get to enjoy the fruits - or in this case vegetables - of their labour, plus they'll be able to create their own green bean teepee. Gardening with kids doesn't get better than this. "I don't like digging in soil" - said no child ever. Potatoes are another great veggie to grow with kids - digging for potatoes when it's time to harvest your crop can feel a lot like hunting for buried treasure. The sprouts, leaves and fruit stems of potatoes are inedible (toxic), so unless you intend to closely supervise the growing of potatoes, it's an activity that's best saved for older children. Who wants a fabulous personalised Jack O' Lantern? Everyone, right? Northwest Edible Life offers a great tutorial on how to carve your child's names into the side of a pumpkin. Your children will be the envy of all their friends come Halloween - unless of course you make one for every kid you know. Gardening with children is fun and offers a healthy alternative to spending the weekend in front of the TV or latest computer game. While it may or may not be the solution to a fussy eating problem, it will at least offer you the chance to spend some quality time with your kids, get some delicious home grown produce and save on your shopping bill. Just don't expect a single tomato to reach your kitchen. Ever.